These were both fun to make and to eat. I have to admit that we couldn’t wait to eat them so we ate them warm. They were good. Then, after the kids were in bed, I sneaked a small bite and I have to say it is SO much better when it is cooled. That’s my opinion though. I felt there was more taste in it when it was cooled and you weren’t worried about burning your tongue. My 6 year old helped me with this recipe and together, we tried to think of new and different ways to make it when compared to other versions out there. I like this version. Others call for marshmallow fluff but I wanted to keep the authentic taste of warmed, whole marshmallows. Preheat the oven to 350 degrees and spray a 13 x 9 inch pan. In a large bowl using a hand mixer, cream together the sugars and the butter. When mixed well, add the salt, vanilla and egg. Then add the graham cracker crumbs. Add the flour a little at a time and mix thoroughly. You may need to add more flour depending on the consistency. You will want the dough sticky but not too sticky so that it sticks to your fingers as you are spreading it in the pan. Split the dough in half and take one half and spread it out on the bottom of the pan. You can use this method or the method used to create the top of the bar using Ziploc bags (see 2nd picture below). Next, lay out the 6 bars of chocolate and then place the marshmallows on top. I cut the marshmallows in half but you can use them whole. 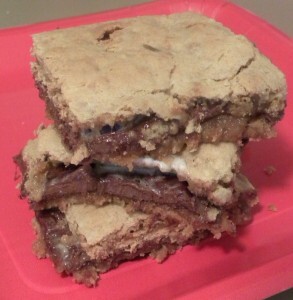 You can even use mini marshmallows or marshmallow fluff. 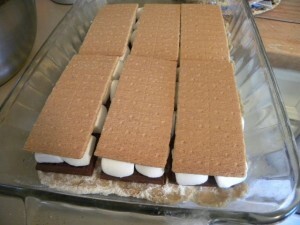 Next, place the 6 whole graham crackers on top as another layer as pictured below. Now it is time to top the bar with the remaining dough. 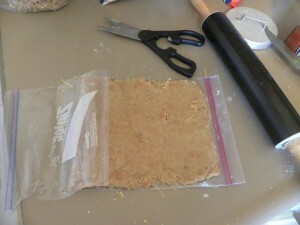 I split the remaining dough in half and placed each half in a Ziploc bag. Using a rolling pin, I rolled it out and cut the two sides down the middle. That allowed me to nicely shape the dough which was the perfect size to cover half of the pan. I then repeated the process with the 2nd bag. Bake in your preheated oven for 30 minutes. Let cool and enjoy with a tall glass of milk. Mmmmmmm! 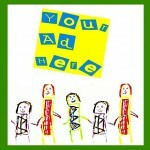 Don’t lose track of me…..re-pin me on Pinterest.